Close on the heels of President Maithripala Sirisena’s controversial claim that foreign loans amounting to Rs. 9 trillion that had been procured during the Rajapaksa administration (2006-2014) couldn’t be accounted for, a comprehensive study undertaken by the Auditor General’s Department has confirmed the staggering figure. However, the period at issue as well as ‘funding sources’ are inaccurate, The Island learns. Parliament is expected to receive a comprehensive AG’s Department report on the status of government debt before the Feb. 10 local government polls. Well informed sources told The Island that contrary to President Sirisena’s statement, Rs. 10 trillion had been borrowed from both foreign and domestic lenders and of that amount two trillion had been obtained before the Nov. 2005 presidential polls. The borrowed money included funds raised in domestic market by way of treasury bonds and treasury bills. 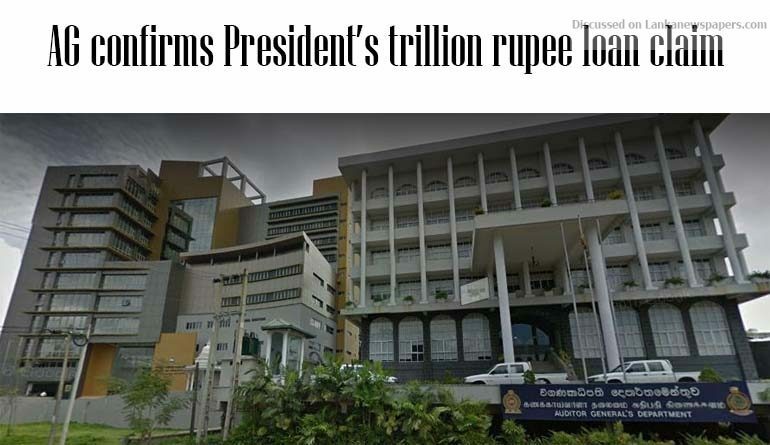 President Sirisena on Jan. 26 told a gathering of media representatives at the President’s House that the national economy was in peril due to massive foreign loans taken during the Rajapaksa administration. The President said that of the nine trillion borrowed only one trillion had been accounted for. Sources said the AG’s report was likely to be sent to Parliament on Monday (Feb.5). Asked whether the report would be released online and likely to be debated in parliament, sources said that as the AG’s findings also dealt with the issuance of treasury bonds and treasury bills during that period, the parliament couldn’t ignore it when Bond Commission report would be debated in parliament on Feb.6. Authoritative sources said that the Central Bank had always resisted the AG though it was subjected to state auditing process. Sources recalled how Central Bank fiercely defied AG’s efforts to secure access to documents in the wake of treasury bond scams involving the Perpetual Treasuries Limited (PTL) before the Parliamentary Committee on Public Enterprises (COPE) intervened on behalf of the AG. Sources said that unprecedented drastic measures would be required to arrest the rapidly deteriorating situation. The AG’s report would detail the situation vis a vis foreign and domestic loans, they said. Recently, former CBSL Governor Cabraal and former Chairman of the Securities and Exchange Commission (SEC) told a media briefing at Ramada that Sri Lanka’s largest annual tender is for the sale of government securities, treasury bonds and treasury bills amounting to approximately Rs. 2,000 billion . Sources said Parliament as the ultimate authority accountable for public finances could examine the debt crisis and the Bond Commission report. Speaker Karu Jayasuriya’s Office on Thursday said that the February 06 debate on Bond Commission and PRECIFAC reports could be later extended to another day or two. The parliament will meet again on Feb 19. Sources said that the actual public debt could be even more than Rs. 10 trillion. Responding to another query, sources said that the actual situation could be even worse than President Sirisena’s assertion. Sources acknowledged that the forthcoming report could certainly place major political parties at an embarrassing position. The large scale borrowings had been utilised to bridge the ever expanding budget deficit for want of a prudent national economic policy and tax reforms, they said.